On behalf of UGC, Mother Teresa Women’s University, Kodaikanal (MTWU), Tamil Nadu announces holding of the State Eligibility Test (TNSET-2016) on 21.02.2016 (SUNDAY) for determining the eligibility for Assistant Professor in Tamil Nadu universities and colleges.MTWU will conduct TNSET-2016 in 25 subjects at 16 selected Centres of Examination spread across the state. 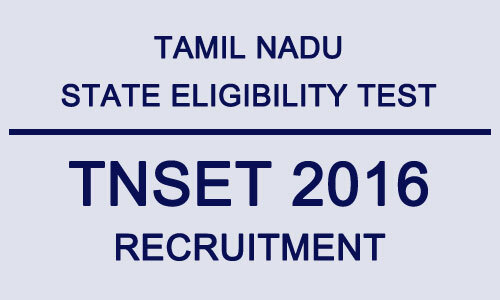 Candidates who qualify the TNSET- 2016 are governed by the recruitment rules and regulations stipulated for the Assistant Professors of concerned Universities / Colleges /Institutions (Government/ Aided /Private) of Tamil Nadu State. Candidates who have secured at least 55% of marks (without rounding off) for General category and 50% for Backward Classes, Most Backward Classes (MBC) / Denotified Communities (DNC) / Scheduled Caste (SC), Scheduled Tribe (ST), Persons with Disability (PWD-VH/PH), in Master’s Degree OR equivalent examination from universities / institutions recognized by UGC New Delhi, in subjects like Science, Humanities (including languages), Social Science, Computer Science & Applications, Electronic science etc., are eligible to appear for this test. 2. Candidates who have appeared (OR) will be appearing at the Master’s Degree (final year) examination and whose result is still awaited (OR) candidates whose qualifying examinations have been delayed may also appear for this test. However, such candidates will be admitted provisionally and for those who clear the TNSET- 2016 examination, eligibility certificate will be issued only on production of proof for having passed the Master’s degree or equivalent examination securing at least 55% marks (without rounding off) for General Category and 50% for Backward Classes/ Most Backward Classes (MBC) / Denotified Communities (DNC) / Scheduled Caste (SC), Scheduled Tribe (ST), Persons with Disability (PWD-VH/PH), within two years from the date of TNSET-2016 examination, failing which they will be treated as disqualified. There is no upper age limit for applying for TNSET- 2016 examination. 1. The candidates may pay the examination fee either by credit/ debit card or through echallan generated during the online filling of the application form. In case of e-challan the payment should be made in the SBI. In case the examination fee is paid through credit/debit card the additional processing charges as following will also be debited from the credit/debit card of the candidate along with applicable taxes. 2. After filling all the details for applying online for TNSET-16, the candidate will have the option to select the mode of payment of examination fee either by credit/debit card or through e-challan generated during the online filling of the application form indicating their details therein. Candidate must enter his/her mobile number only while making payment. · Passport size photograph in JPG format of minimum 4kb to 40 kb. The dimension of the photograph should be 3.5 cm (width) x 4.5 cm (height). · Signature in JPG format of minimum 4kb to 30 kb. The dimension of the signature should be 3.5 cm (width) x 1.5 cm (height). The candidates are required to bring a photo identity card along with their Printout of online admission card on the day of examination.